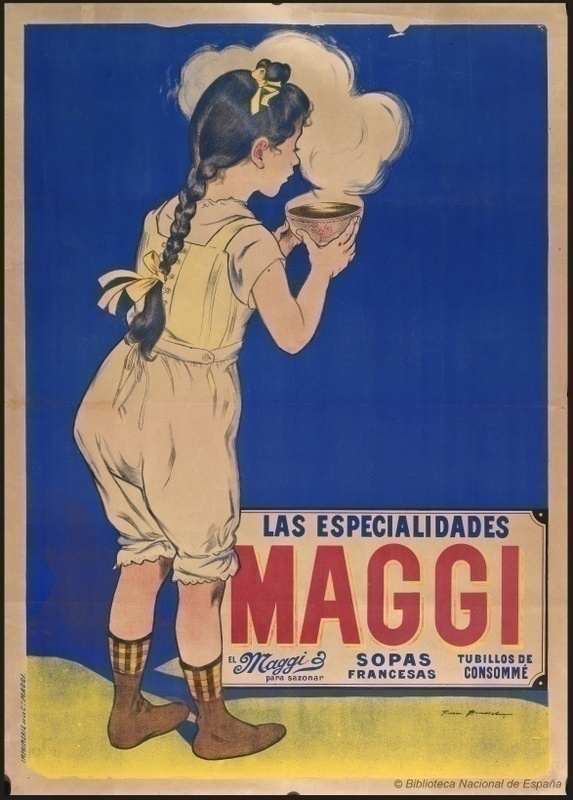 Spanish poster advertising Maggi soups. In the 1870s, Swiss industrialist Julius Maggi invented the first dehydrated soup. He aimed to provide nutritious and flavorful meals for working women who lacked the time and money to prepare home-cooked meals. His interest in improving lives of the working class was philanthropic in nature and was in keeping with his other efforts, such as such as building houses for workers. In this sense, he was similar to Quaker capitalists like chocolate firms Cadbury and Rowntree in Britain, which saw their cocoa as a healthy alternative to alcoholic drinks. Later, Maggi developed liquid seasoning, which, partly thanks to its distinctive bottle, soon became the most recognizable food product in Europe. In fact, it was one of the earliest European product brands. Maggi's company quickly became a very profitable industrial enterprise. The use of Maggi products was promoted by the Swiss Public Benefit Society (Schweizerische Gemeinnutzige Gesellschaft) and became a part of dietary habits in across Europe. Not all of his products were so successful. A protein-rich bean powder, for example, was largely dismissed as "poor man’s food." Aaker, David A. and Erich Joachimsthaler. Brand Leadership. New York: Simon & Schuster, 2000. Food Technology, Science and Marketing: European Diet in the Twentieth Century, edited by Adel P. den Hartog. East Linton: Tuckwell Press, 1995. When artificial foods were introduced in the second half of the nineteenth century, they were widely hailed as technological and scientific progress. They seemed to promise to solve social problems and liberate humanity from the threat of famine once and for all. But choosing what goes on the table is an individual decision, and trust in new foods does not come automatically. Is artificial food safe? But returning to a more "natural" diet is not easy either, because - let's be honest - how real is that "authentic" food?